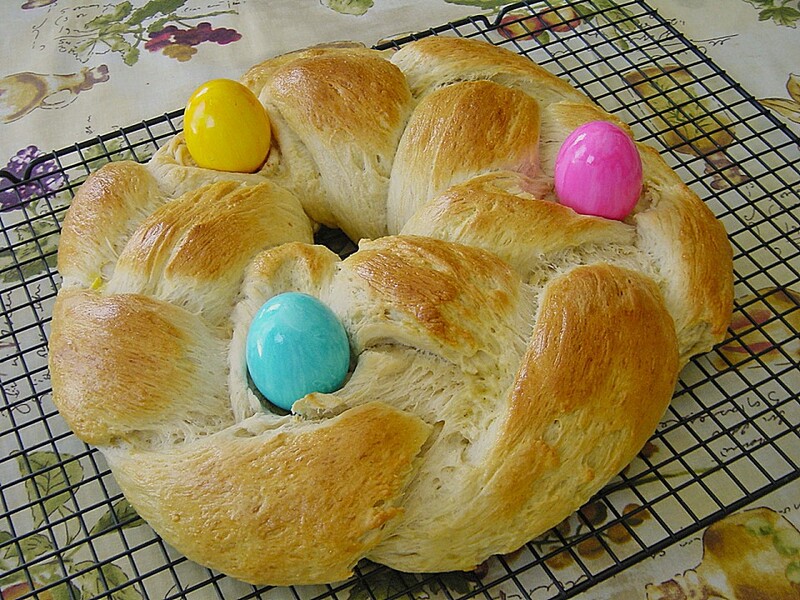 The Easter Sweet Bread Wreath with 3 hard boiled and colored eggs is a great sweet bread for the Easter table. Easter is the time for good food, like lamb, cakes and ham, egg hunts and chocolate in form of eggs and rabbits. Happy Baking! - Place flour into a bowl, make a mold in the middle. - Mix yeast with some sugar and warm milk, add it into the mold and mix with some flour. - Add remaining sugar, cardamom, salt, milk and 3 eggs, knead until you get a smooth dough (not sticky or firm); maybe you need some more milk. - Place dough on a baking board with some flour and knead for about 6-8 minutes, place back into the bowl, cover it with a moist fabric and let it rest for 1 hour until volume has doubled. - Meanwhile take a card board roll like from an empty kitchen paper roll, cut it in 3 pieces and wrap them with aluminum foil. This is for creating a space for the eggs. - Place baking paper on a baking tray. - Now knead dough again briefly and divide in 3 parts which you roll to 3 rolls of 65cm (25 inches) length. - Make a braid out of the 3 dough rolls and place it on the baking tray. - Gently press the cardboard rolls at 3 spots into the dough. Best place is at the ends of the braid. - Let dough rise again (place the whole tray into a clean plastic bag and knot it or cover it with a moist kitchen cloth) for about 30 min. Volume needs to be visibly more. - Pre-heat oven to 180 c or 360 F.
- Beat 1 egg and add 1 tbsp milk, mix well. Spread over the wreath. - Bake it for 30 minutes until it has a golden color. - Place it on a cooling rack (use a cake shovel), take out the 3 rolls and replace them with 3 hard boiled and colored eggs.